Benchmarking should be done by experienced professionals with the ability to analyse competitors’ data and industry trends. Though effective in helping businesses improve their operational performance, it is criticised for its limited emphasis on innovation. 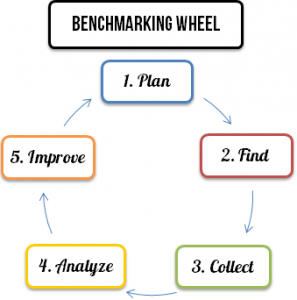 In addition to the types, there are four ways you can do benchmarking. It is important to choose the optimal way because it reduces the costs of the activity and improves the chances to find the ‘best standards’ you can rely on. Internal benchmarking. In large organizations, which operate in different geographic locations or manage many products and services, same functions and processes are usually performed by different teams, business units or divisions. This often results in processes performed very well in one division but poorly in another. Internal benchmarking is used to compare the work of separate teams, units or divisions to identify the ones that are working better and share the knowledge throughout the company to other teams to achieve higher performance. It is usually employed by the companies that have recently expanded geographically, but haven’t yet created proper knowledge sharing systems between divisions. If such systems are in place, there’s no need to use internal benchmarking to look for best practices. External or competitive benchmarking. Some authors use these terms interchangeably but there are a few differences between them. First, competitive benchmarking refers to a process when a company compares itself with the competitors inside its industry. Whereas external benchmarking looks both inside and outside the industry to find the best practices, thus, including competitive benchmarking. Second, competitive benchmarking, in my opinion, will only be used with performance benchmarking to compare your products and services. Strategic or process benchmarking won’t be viable options, because it’ll be very hard to find a competitor, who wants to share sensitive information with you and you’ll never outcompete your rival if you’ll be using his strategy or processes. Besides, external benchmarking is a more beneficial approach to use due to higher possibilities of finding the best practices. Functional benchmarking. Managers of functional departments find it useful to analyze how well their functional area performs compared to functional areas of other companies. It is quite easy to identify the best marketing, finance, human resource or operations departments, in other companies, that excel in what they do and to apply their practices to your own functional area. This way the companies can look at a wide range of organizations, even unrelated ones, and instead of improving separate processes, they can improve the whole functional areas. Generic benchmarking. According to Kulmala, it refers to comparisons, which “focus on excellent work processes rather than on the business practices of a particular organization”. For example, your company tries to improve its marketing capabilities and benchmarks itself against company ‘A’. While observing company’s ‘A’ marketing processes you also notice how well their human resources are managed using ‘big data’ analytics. This gives you an idea to implement the data collecting and analysis team in your own company to significantly improve its overall performance. The other example of generic benchmarking would be to compare your processes against generally accepted best standards. For example, every organization strives to become a learning organization, because such an organization is better equipped to overcome challenges and adapt to the market changes. By comparing your company to some general standards, which would indicate that your company is a learning organization, you would be using generic benchmarking. Summary of benchmarking tool. There are 3 benchmarking types: strategic, performance and process. There are also 5 approaches: internal, external, competitive, functional and generic. If done properly, it’s a low cost activity that offers huge gains. Brings innovative ideas to the company. Provides you with insight of how other companies organize their operations and processes. Increases the awareness of your costs and level of performance compared to your rivals. Facilitates cooperation between teams, units and divisions. You need to find a benchmarking partner. It is sometimes impossible to assign a metric to measure a process. You might need to hire a consultant. If your organization is not experienced at it, the initial costs could be huge. Managers often resist the changes that are required to improve the performance. Some of best practices won’t be applicable to your whole organization. Benchmarking is used extensively by organizations, but no universal process of how to conduct it is established. Each organization designs its own way of using the tool. Before revealing some of the examples, we provide you with the guidelines to make the process easier. Only choose the products, services or processes, which perform poorly. Comparing the processes you are good at will be a waste of time and money, and won’t bring the desired results. Define the specific metrics or processes to measure. Be careful not to choose too broad processes that can’t be measured as you won’t be able to compare it properly. Prepare your company for change. Your organization must overcome the resistance to change to implement new best practices. Choose the team that is qualified. Although benchmarking is easy to use, you shouldn’t pick up just anybody to do it. Include the people that will be responsible for implementing the changes and the people that are skilled at it. Participate in benchmarking networks and use the appropriate software to facilitate the process. There are various benchmarking networks, where participating companies can find benchmarking partners or gather the data for the metrics they need. Such participation facilitates the process significantly by reducing the costs and time spent looking for the right data. Look for the best standards and ideas even in unrelated areas. Many significant discoveries will be made by observing the companies that are completely unrelated to your organization. The benchmarking wheel model introduced in article “Benchmarking for Quality” is a 5 stage process that was created by observing more than 20 other models. Plan. Assemble a team. Clearly define what you want to compare and assign metrics to it. Find. Identify benchmarking partners or sources of information, where you’ll be able to collect the information from. Collect. Choose the methods to collect the information and gather the data for the metrics you defined. Analyze. Compare the metrics and identify the gap in performance between your company and the organization observed. Provide the results and recommendations on how to improve the performance. Improve. Implement the changes to your products, services, processes or strategy.